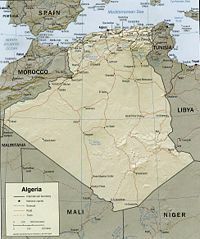 The People's Democratic Republic of Algeria is Muslim nation in North Africa, and the second-largest nation on the continent. Algeria, the second-largest state in Africa, has a Mediterranean coastline of about 998 kilometers (620 mi.). The Tellian and Saharan Atlas mountain ranges cross the country from east to west, dividing it into three zones. Between the northern zone, Tellian Atlas, and the Mediterranean is a narrow, fertile coastal plain—the Tell (Arabic for hill)--with a moderate climate year round and rainfall adequate for agriculture. A high plateau region, averaging 914 meters (3,000 ft.) above sea level, with limited rainfall, great rocky plains, and desert, lies between the two mountain ranges. It is generally barren except for scattered clumps of trees and intermittent bush and pastureland. The third and largest zone, south of the Saharan Atlas mountain range, is mostly desert. About 80% of the country is desert, steppes, wasteland, and mountains. Algeria's weather varies considerably from season to season and from one geographical location to another. In the north, the summers are usually hot with little rainfall. Winter rains begin in the north in October. Frost and snow are rare, except on the highest slopes of the Tellian Atlas Mountains. Dust and sandstorms occur most frequently between February and May. Soil erosion—from overgrazing, other poor farming practices, and desertification—and the dumping of raw sewage, petroleum refining wastes, and other industrial effluents are leading to the pollution of rivers and coastal waters. The Mediterranean Sea, in particular, is becoming polluted from oil wastes, soil erosion, and fertilizer runoff. There are inadequate supplies of potable water. Like most of the middle east, the current population in modern Algeria is by Arabs that have Arabized the indigenous people, the Berbers are considered to be the real natives to north Africa. Under the 1976 Constitution (as modified 1979, and amended in 1988, 1989, and 1996) Algeria is a multi-party state. The Ministry of the Interior must approve all political parties. According to the Constitution, no political association may be formed "based on differences in religion, language, race gender or region." Algeria has universal suffrage at the age of 18. The head of state is the president of the republic. The president, elected to a five-year term, and constitutionally limited to two terms, is the head of the Council of Ministers and of the High Security Council. He appoints the prime minister as well as one-third of the upper house (the Council of the Nation). The prime minister presides over the Council of Ministers and serves as head of the government. The Algerian Parliament is bicameral, consisting of a lower chamber, the National People's Assembly (APN), with 380 members and an upper chamber, the Council of the Nation, with 144 members. The APN is elected every five years. Legislative elections were held in May 2007. Two-thirds of the Council of the Nation is elected by regional and municipal authorities; the rest are appointed by the president. The Council of the Nation serves a six-year term with one-half of the seats up for election or reappointment every three years. Either the president or one of the parliamentary chambers may initiate legislation. Legislation must be brought before both chambers before it becomes law. Sessions of the APN are televised. Algeria is divided into 48 wilayates (states or provinces) headed by walis (governors) who report to the Minister of Interior. Each wilaya is further divided into communes. The wilayates and communes are each governed by an elected assembly. Terrorist violence in Algeria resulted in more than 100,000 deaths during the 1990s. Although the security situation in the country has improved, addressing the underlying issues that brought about the political turmoil of the 1990s remains the government's major task. President Bouteflika implemented the Charter on Peace and National Reconciliation on March 1, 2006, as one way to bring closure. Thus far, it has successfully gained the surrender of a number of moderate Islamists, but paradoxically, has emboldened the more hard-core elements, in particular the Salafist Group for Preaching and Combat (GSPC), which changed its name in January 2007 to Al-Qaida in the Islamic Maghreb (AQIM). In keeping with its amended Constitution, the Algerian Government espouses participatory democracy and free-market competition. The government has stated that it will continue to open the political process and encourage the creation of political institutions. Presidential elections took place in April 2004 and returned President Bouteflika to office with 84.99% of the vote. The next presidential elections are scheduled for 2009. Algeria has more than 45 daily newspapers published in French and Arabic, with a total circulation of more than 1.5 million copies. There are 20 domestically printed weekly publications with total circulation of 622,000 and 11 monthly publications with total circulation of 600,000. In 2001, the government amended the Penal Code provisions relating to defamation and slander, a step widely viewed as an effort to rein in the press. While the Algerian press is relatively free to write as they choose, use of the defamation laws significantly increased the level of press harassment following President Bouteflika's April 2004 re-election victory, and as a result, the press began to self-censor. In July 2006, President Bouteflika pardoned all journalists convicted of defaming or insulting state institutions. The pardon effectively dismissed the charges against 67 people. Critics point out that according to the criminal code, insulting the president is punishable by prison sentence. Nevertheless, the pardon was widely seen as a significant step toward democracy. The government holds a monopoly over broadcast media; Algerian newspapers are widely seen to be the freest in the region. Population growth and associated problems—unemployment and underemployment, inability of social services to keep pace with rapid urban migration, inadequate industrial management and productivity, a decaying infrastructure—continue to affect Algerian society. Increases in the production and prices of oil and gas over the past decade have led to exchange reserves reaching $80 billion. The government began an economic reform program in 1994, focusing on macroeconomic stability and structural reform. These reforms aimed at liberalizing the economy, making Algeria competitive in the global market, and meeting the needs of the Algerian people. In 2004, the government announced a $55 billion spending program to improve national infrastructure and social services; subsequent announcements have increased the proposed program to $120 billion. Algeria has traditionally practiced an activist foreign policy and in the 1960s and 1970s was noted for its support of Third World policies and independence movements. Algerian diplomacy was instrumental in obtaining the release of U.S. hostages from Iran in 1980. Since his first election in 1999, President Bouteflika worked to restore Algeria's international reputation, traveling extensively throughout the world. In July 2001, he became the first Algerian President to visit the White House in 16 years. He has made official visits to France, South Africa, Italy, Spain, Germany, China, Japan, Portugal, Russia, the United Kingdom, and Latin American countries, among others, since his inauguration. Algeria has taken the lead in working on issues related to the African continent. Host of the Organization of African Unity (OAU) Conference in 2000, Algeria also was key in bringing Ethiopia and Eritrea to the peace table in 2000. In 2001, the 37th summit of the OAU formally adopted the New Partnership for Africa's Development (NEPAD) to address the challenges facing the continent. Algeria has taken a lead in reviving the Union of the Arab Maghreb with its neighbors. Since 1976, Algeria has supported the Polisario Front, which claims to represent the population of Western Sahara. Contending that the Sahrawis have a right to self-determination under the UN Charter, Algeria has provided the Polisario with support and sanctuary in refugee camps in the southwestern Algerian province of Tindouf. UN involvement in the Western Sahara includes MINURSO, a peacekeeping force, UNHCR, which handles refugee assistance and resettlement, and the World Food Program (WFP). Active diplomatic efforts to resolve the dispute under the auspices of the United Nations Secretary General are ongoing. Algeria's support of self-determination for the Polisario is in opposition to Morocco's claim of sovereignty. The dispute remains a major obstacle to bilateral and regional cooperation. Although the land border between Morocco and Algeria was closed in the wake of a terrorist attack in 1994, the two have worked at improving relations, and in July 2004, Morocco lifted visa requirements for Algerians. Algeria reciprocated with the lifting of visa requirements for Moroccans on April 2, 2005. Algeria has friendly relations with its other neighbors in the Mahgreb, Tunisia and Libya, and with its sub-Saharan neighbors, Mali and Niger. It closely monitors developments in the Middle East and has been a strong proponent of the rights of the Palestinian people, as well as a supporter of Iraq's democratic transition. Algeria has diplomatic relations with more than 100 foreign countries, and over 90 countries maintain diplomatic representation in Algiers. Algeria held a nonpermanent, rotating seat on the UN Security Council from January 2004 to December 2005. Algeria hosted 13 Arab leaders at the Arab League Summit, March 22–23, 2005. Algeria's armed forces, known collectively as the Popular National Army (ANP), total 138,000 active members, with some 100,000 reservists. The president serves as Minister of National Defense. Military forces are supplemented by a 60,000-member national gendarmerie, a rural police force, under the control of the president and a 30,000-member Sureté Nationale or Metropolitan Police force under the Ministry of the Interior. Eighteen months of national military service is compulsory for men. Algeria is a leading military power in the region and has demonstrated remarkable success in its struggle against terrorism. The Algerian military, having fought a decade-long insurgency, has increased expenditures in an effort to modernize and return to a more traditional defense role. Due to historical difficulties in acquiring U.S. military equipment, Algeria's primary military supplier has traditionally been Russia, and to a lesser extent China; Algeria recently made large purchases of advanced weaponry from the former. Algeria has, however, in recent years, begun to diversify its supplies of military equipment to include U.S.-made airborne surveillance aircraft and ground radars. The hydrocarbons sector is the backbone of the Algerian economy, accounting for roughly 60% of budget revenues, nearly 30% of GDP, and over 97% of export earnings. Algeria has the ninth-largest reserves of natural gas in the world (2.7% of proven world total) and is the fourth-largest gas exporter; it ranks 14th for oil reserves (2006). Its key oil and gas customers are Italy, Germany, France, the Netherlands, Spain, the United Kingdom, and the United States. U.S. companies have played a major role in developing Algeria's oil and gas sector; of the $5.3 billion (on a historical-cost basis, according to statistics gathered by the U.S. Department of Commerce, Bureau of Economic Analysis) of U.S. investment in Algeria, the vast bulk is in the petroleum sector. Faced with declining oil revenues and high-debt interest payments at the beginning of the 1990s, Algeria implemented a stringent macroeconomic stabilization program and rescheduled its $7.9 billion Paris Club debt in the mid-1990s. The macroeconomic program has been particularly successful at narrowing the budget deficit and at reducing inflation from of near-30% averages in the mid 1990s to almost single digits in 2000. Inflation was at 3.6% in 2004. Algeria's economy has grown by more than 5% in each of the past five years, posting 5.6% growth in 2006. The country's foreign debt fell from a high of $28 billion in 1999 to $5 billion in 2006; in that year Algeria paid off the last of its Paris Club debt. The spike in oil prices in 1999-2000 and 2004, the government's tight fiscal policy and conservative budgeting of oil prices from 2000 to present, a large increase in the trade surplus, and the near tripling of foreign exchange reserves have helped the country's finances. The government pledges to continue its efforts to diversify the economy by attracting foreign and domestic investment outside the energy sector. The Algerian Government has had little success at reducing high unemployment, officially estimated at 13% in 2006, though international estimates put the figure higher, and at improving living standards. Priority areas are banking and judicial reform, improving the investment environment, partial or complete privatization of state enterprises, and reducing government bureaucracy. The government has privatized certain sectors of the economy and embraced joint venture investment opportunities with traditionally state owned and operated entities. In 2001, Algeria concluded an Association Agreement with the European Union, which was ratified in 2005 by both Algeria and the EU and took effect in September of that same year. The government is working toward accession to the World Trade Organization. Since the 5th century B.C., the native peoples of northern Africa (first identified by the Greeks as "Berbers") were pushed back from the coast by successive waves of Phoenician, Roman, Vandal, Byzantine, Arab, Turkish, and, finally, French invaders. The greatest cultural impact came from the Arab invasions of the 8th and 11th centuries A.D., which brought Islam and the Arabic language. The effects of the most recent (French) occupation—French language and European-inspired socialism—are still pervasive. Ahmed Ben Bella in ca. 1964. Despite efforts to restore the political process, violence and terrorism dominated the Algerian landscape during the 1990s. In 1994, Liamine Zeroual, former Minister of Defense, was appointed Head of State by the High Council of State for a three-year term. During this period, the Armed Islamic Group (GIA) launched terrorist campaigns against government figures and institutions to protest the banning of the Islamist parties. A breakaway GIA group—the Salafist Group for Preaching and Combat (GSPC)--also undertook terrorist activity in the country. Government officials estimate that more than 100,000 Algerians died during this period. This page was last modified on 12 July 2016, at 15:41.